ARR! After many battles, a bad case of scurvy, and a long awaited journey over ragin’ seas, the many boxes of treasure doth arrived at me doorstoop. 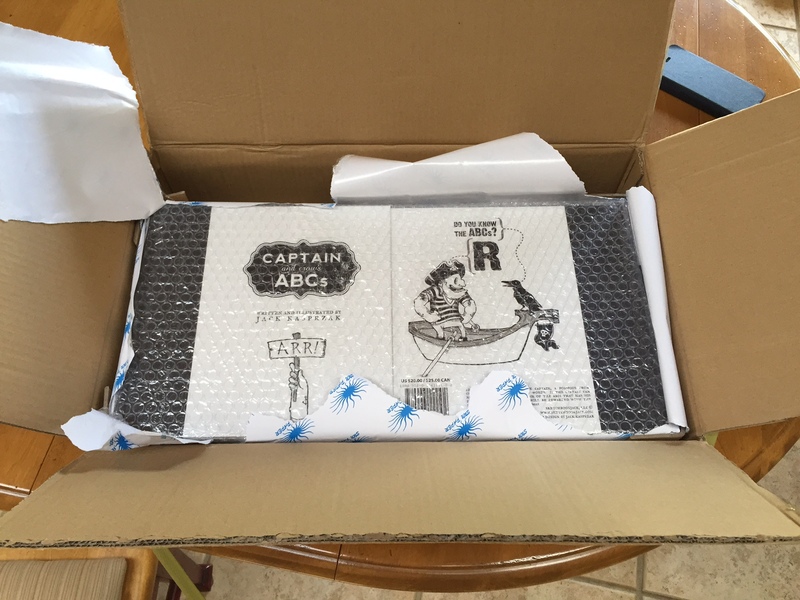 “Captain and Crow’s ABCs” be available for purchase, mateys! Git Learned! It was a long a trying ride but I had a lot of fun doing it. 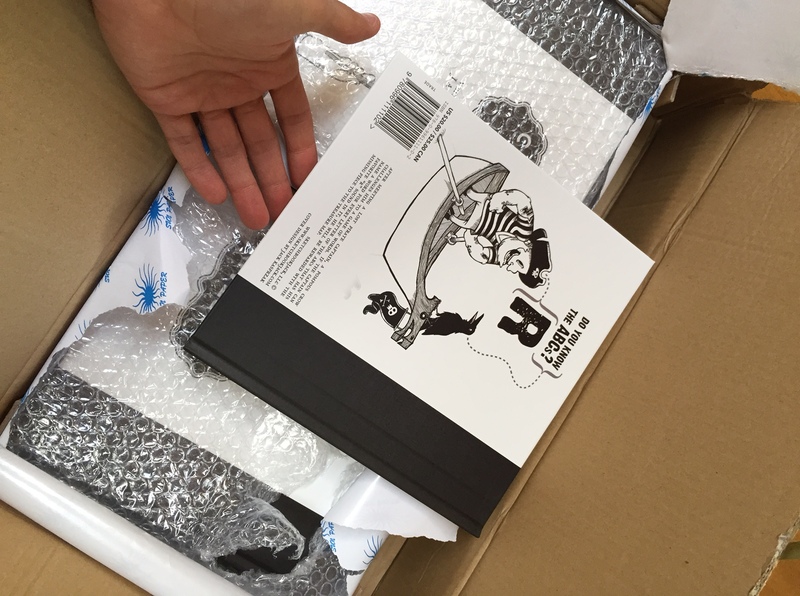 I’ve learned a lot from the process of making this book, so I can move on to the next project with more insight. I hope it can bring a couple of smiles to faces. 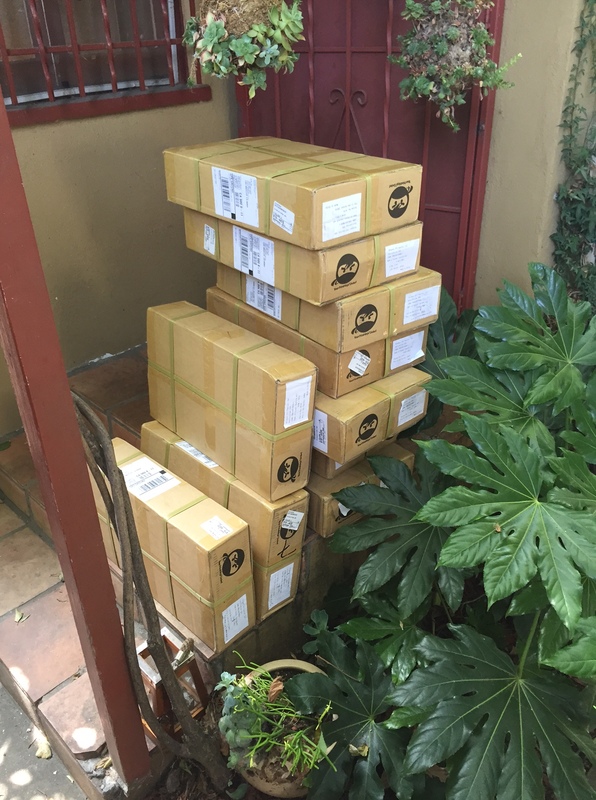 There is big news for SketchbookJack. 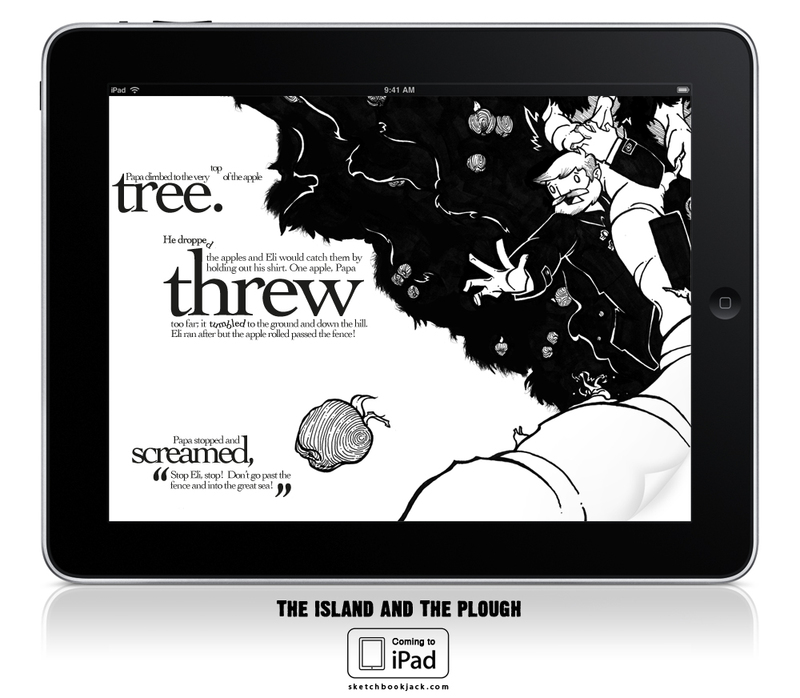 An interactive iPad ebook app is currently in the works. 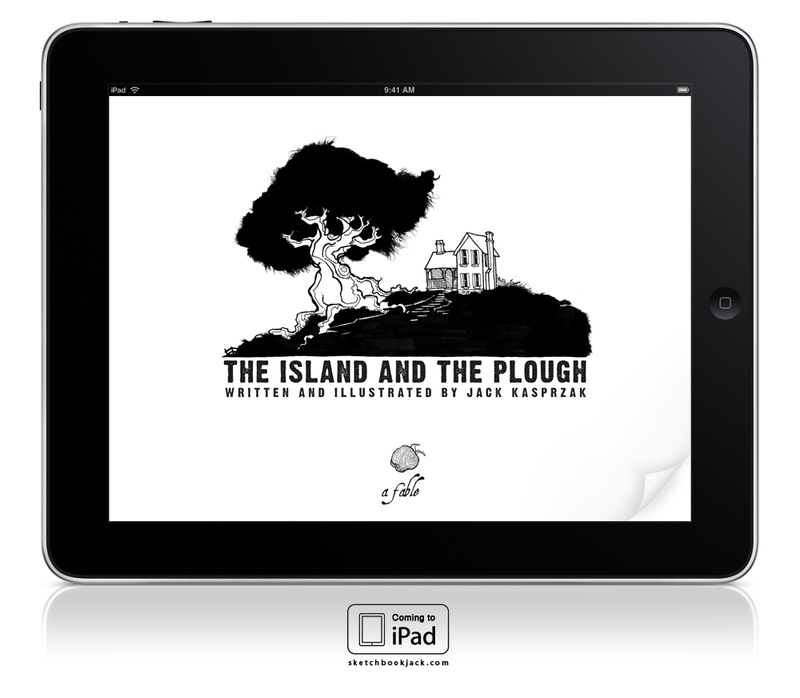 The first app will be “The Island and the Plough.” All the bold, black and white illustrations will come to life with animations, a narrator, and even an apple-catching mini-game. I don’t want to spoil too much, so stay tuned and I’ll post a few more screenshots. Here is a sneak peak of my latest book project. I am working on finding an agent and pitching around “The Island and the Plough” but I am continuing to build up other projects, because there are plenty more to come. Here we have “Captain and Crow’s ABCs”. The Captain finds a smart Crow who challenges him to to a test. First he is asked if he knows his ABCs, to which the Captain replies “ARR!” only to be followed by asking what his favorite letter is. Of course, it is R. The crow challenges him to name a word for every letter in the alphabet that has an R sound in it. Here, the Captain is almost stumped by the letter I, and much confusion arises between I, eye and aye. 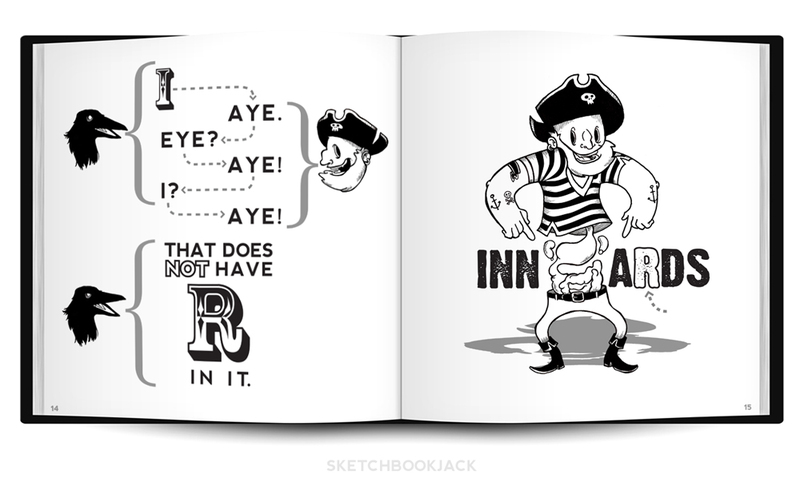 Captain is almost stumped with I, but then he finds a word that has an ARRRRR in it. I’ve been waiting for a while now to share this with you, and since the producer has released the art I can show it now. This was a great project to work on and it will be printed on limited edition 7″ vinyl no less! I was given the lyrics of the song and came up with some characters and symbolism. There will also be art to see for the back sleeve and the inside vinyl label itself but those are yet to be released. Here you can find DeFacto Entertainment and Raw Product. Below is the final front cover and some work in progress, making of’s so you can see how the layout, the sketch and ink process. 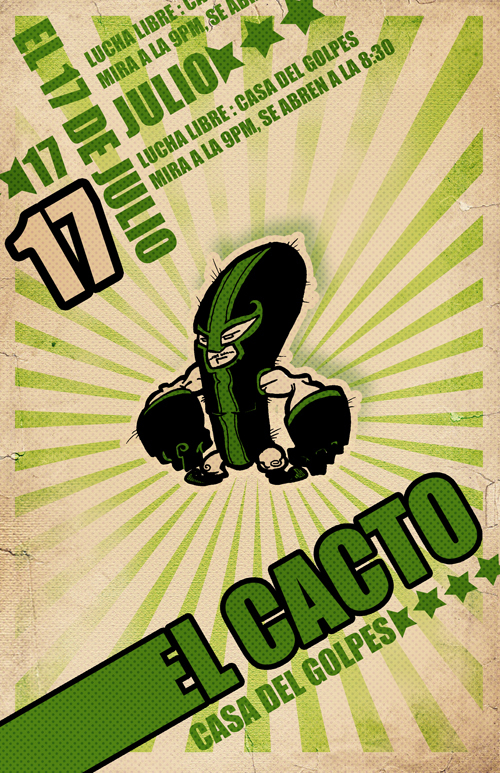 ¡ It’s Lucha time! 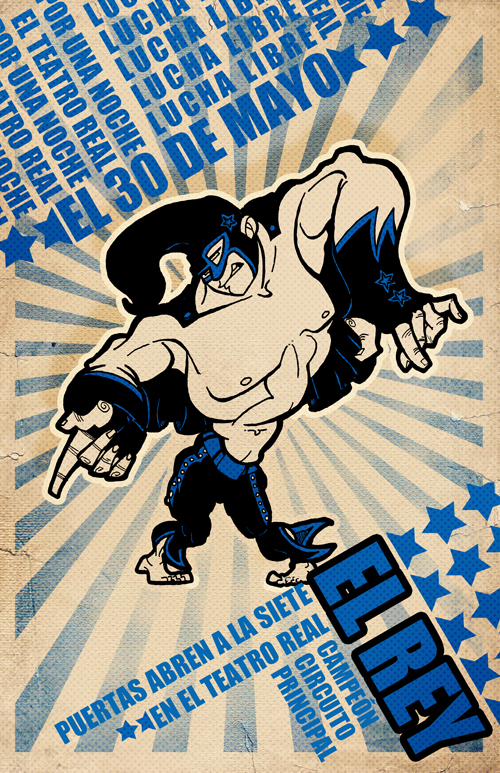 For those of you that remember the Lucha Libre characters I posted a while back: here are a few of the fighters in full glory, depicted as retro advertisement posters you might see stapled, or stuck with chewed gum, to a telephone pole. Forgive me; my Spanish is a little rusty so if anyone would like to act as a proof reader or suggest slogans and phrases that should be on here, by all means, let me know! Otherwise, enjoy, and don’t forget to get tickets to the next fight to see your favorite wrestler. ¡ I also have a grammar and etymology trivia question! ¿Why does the Spanish language use an upside down exclamation point and question mark before and after the sentence? ¿And why not for periods and other punctuation? ¿Is it only to warn you that a point of excitement is about to come? ¿What if the first half of your sentence is not a question but the second half is? 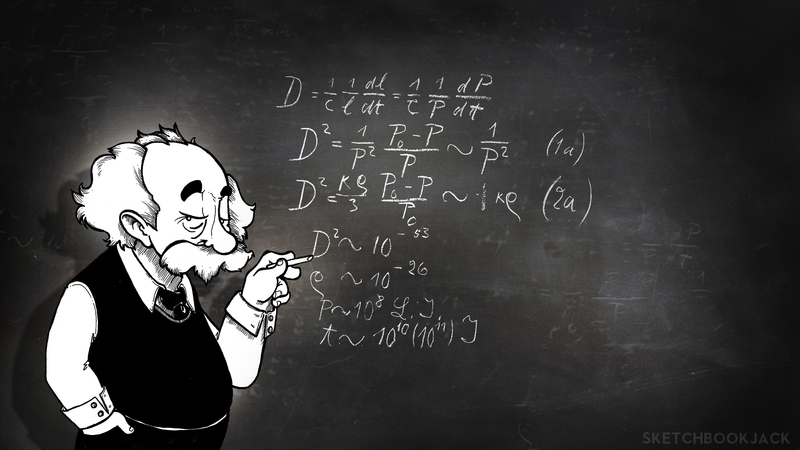 Happy Pi Day Albert Einstein! How awesome is that? 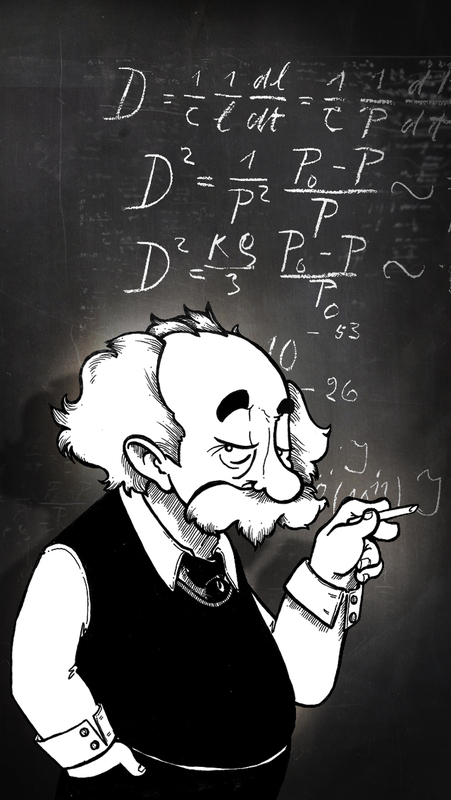 Albert Einstein’s birthday (March, 14th, 1879) and Pi Day (3.14) are on the same day? The only thing that would be better would be if his birthday was on 299,792,458 (speed of light) day, but I don’t think that occurs, ever. I think we should celebrate by cracking the code to marrying relativity and quantum theory together. Well, let’s just start with having a piece of pie; that seems more manageable for today. 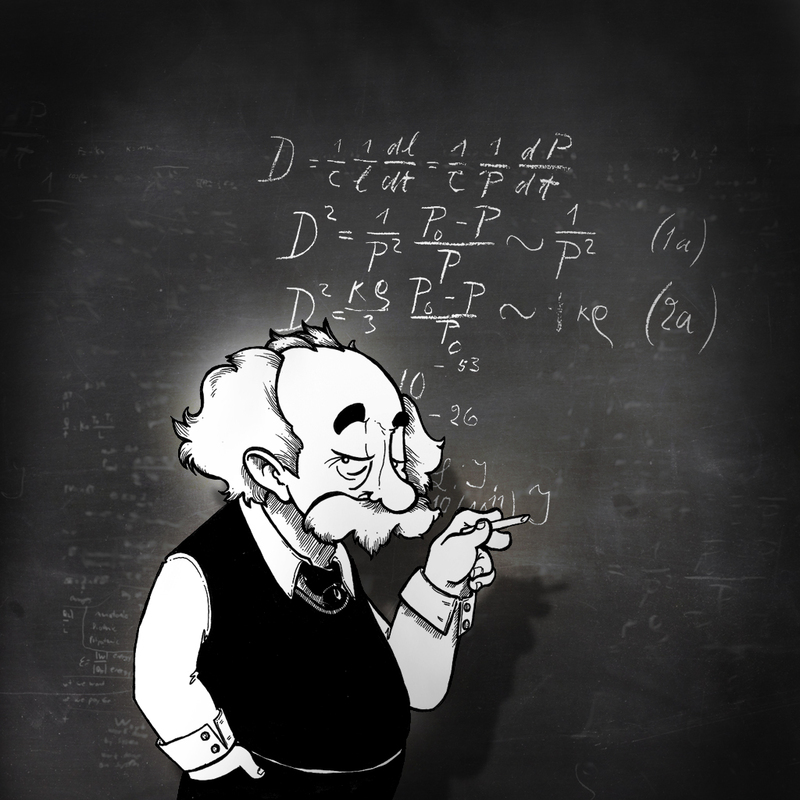 So, for all you math and science fans out there here are two wallpapers for you. Just click to get the full resolution and then you can save it to your device. E is for Edward, he’d be eighty eight, I say. 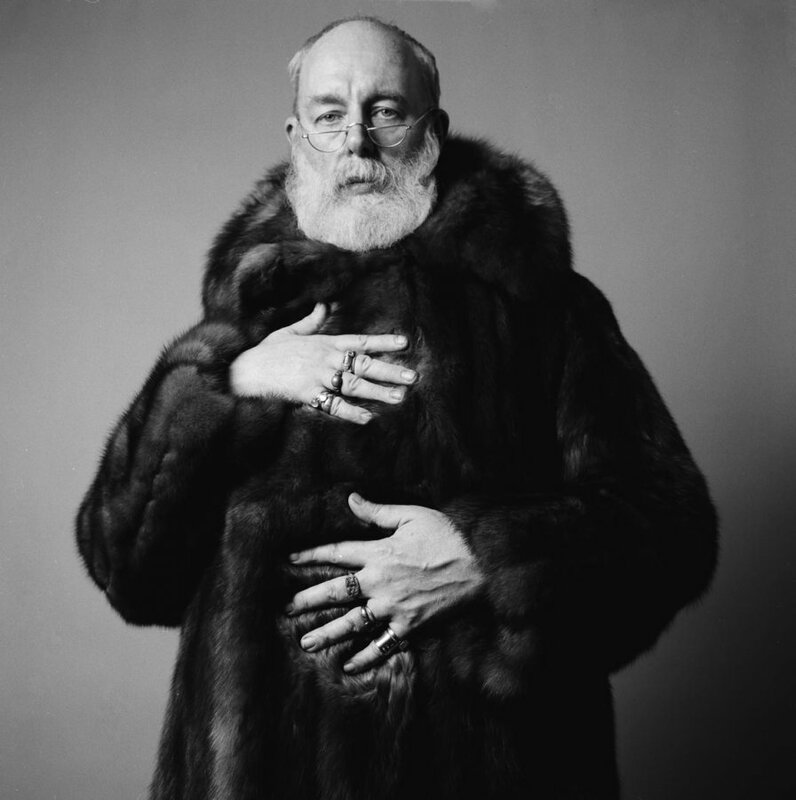 G is for Gorey, happy, happy Birthday. Read The Gashlycrumb Tinies here. 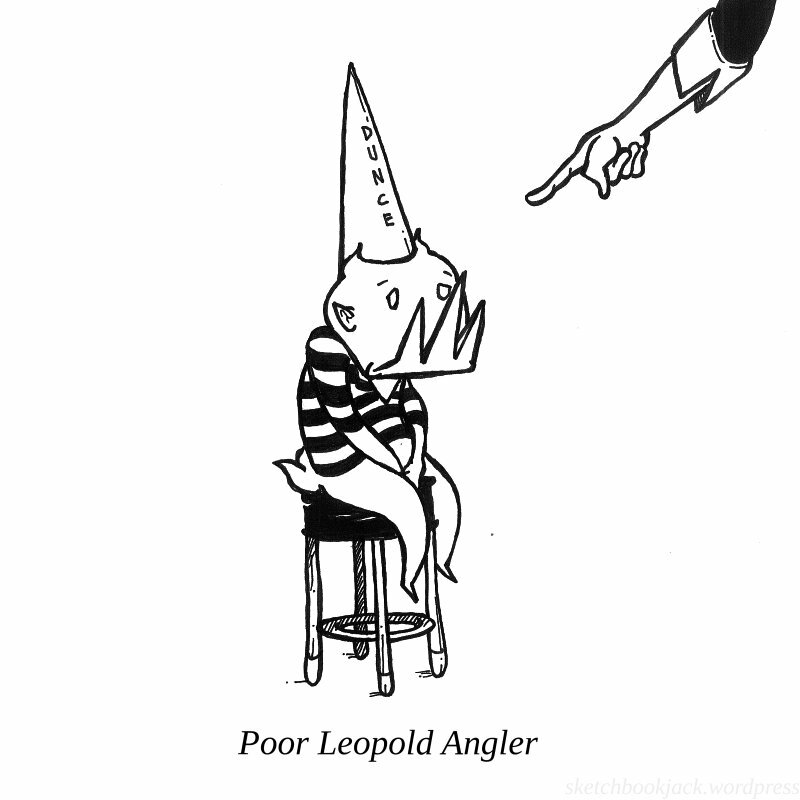 Poor Leopold Angler, suspended for something he probably didn’t do. Want to know more about Leopold Angler and his brother? Find out some more here. 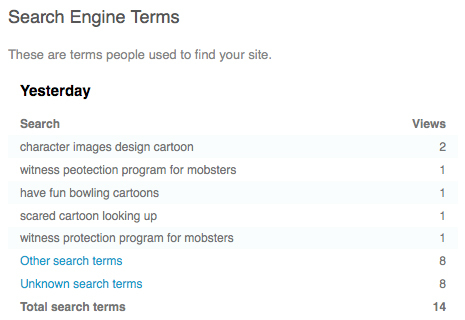 Over at The Daily Mobster, seems “Fraidy Freddy” has attracted some visitors. Never fear fugitives looking for witness protection, you are welcome here, and free to hide out as long as need. You may even find yourself having fun bowling. Cool man daddio, how about some swanky skins for the old iPhone? I thought it about time for poppin’ some swell wallpapers of the most popular mobsters. Show them around, or just have a little smile every time you turn on your phone at the goofball looking back at you. If anyone has a special request, just shoot me an email via the contact page and I can try to get to it. Hope you all enjoy and don’t forget to stop by, and have your friends stop by, The Daily Mobster once in a while. I have killed another soldier, a faithful old pen. He was but a commoner yet filled a many jacket, blackened a many hat, and darkened a many tie. Yes, I use a Sharpie, sometimes, for inking. I know it is not preferred and you may already be furling your brow at the low manner in which I behave but I have come to like the Sharpie. It is simple and consistent and widely available. I can carry them in a bag and are great for travel or quick works. I know my dirty, low class pen will never survive the test of time without any “archival quality” ink. It will wither and fade in the brash sunlight of west Los Angeles, but I don’t care, for it is a impotent artist who requires special tools. It is a sad artist who blames his tools. I too, once brandished a fancy Moleskine notebook of which holds glorious, legendary powers in hopes to harness the same genius that bled from Hemingway’s veins, hoping it would make my work magical. I too, once carried the famed Micron pen and the Staedler pencils, because no actual artist would dare carry (dare not say use) an unbranded, hideously yellow, #2 pencil of which is not even worthy of using the HB insider lingo. Alas, I still use India Ink, metal tip pens, and brushes but for most everyday workings I have squandered such dreams of Hemingway and draw many of my characters on the forbidden copy paper of which a common, gasp, digital printer might use. Sure, judgments are passed, scoffs and tisks are handed by those in the supply store. But I have work to do, dear critic; I have not time to wander the supply store in search of the lesser user of commoner tools I feel may need a lecture. Unfurl your brow, fellow inker, embrace your unorthodox use of illegitimate tools. Here is a sneak peek into the process behind one of The Daily Mobster characters and a quick tutorial/explanation of how I work and how to design a character. 1. I, of course, start with a sketch which are usually smaller thumbnails on a scrap paper until I find an acceptable shape and basic look. Because of the nature of mobster characters this often revolves around exaggerated features or an interesting shape. This rule works pretty well for non mobsters as well. If you can create a silhouette or a shape that is instantly recognizable to that character you are already on our way to great design. 2. Then I do the light sketch with all the details fleshed out; this allows me to give a little extra focus to certain areas like hands, belts, buttons, or others that need extra attention. This is also the step where you can focus on contrast, as it is the first thing the human eye notices, it is important to decide where heavy blocks of color/black will be and where dense detail will be. A general rule of thumb, when certain areas are very large in area (such as a belly or a chin) give them less detail as their size will attract attention, and when they are smaller or require extra focus fill in the detail (faces, hands, accessories of interest). Use the lines and shapes to help direct attention as well, notice the tie points to the chin and continues the crevasse in his chin. 3. Then I simply start inking over the pencil. Sometimes I ink over the entire drawing with a single width then fill the blacks and weight the lines afterwards and other times I do the complete process little chunks at a time (as seen here) moving across the drawing. 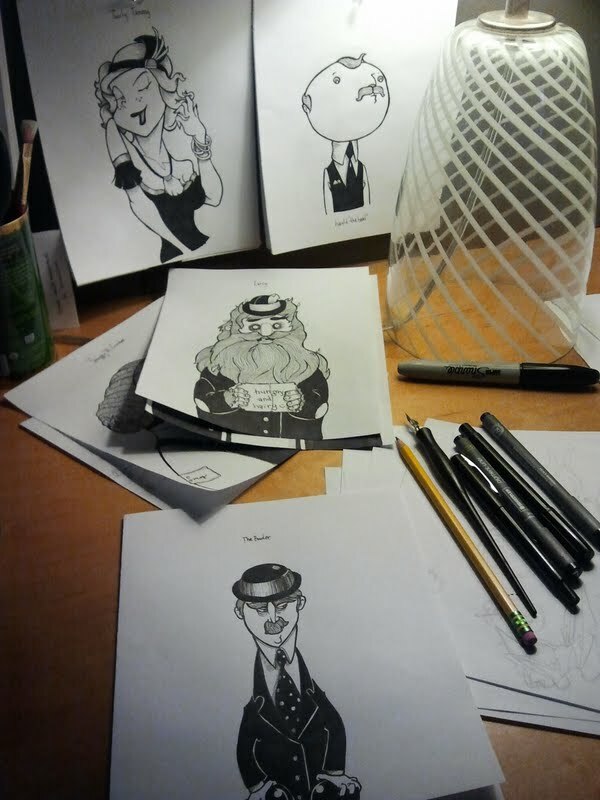 The contrast between full black, white with hatching/textures, and full white is very important in a black and white illustration; luckily suits play a big part in the mobster world. If the background is dark, realize that a heavy black suit will act as a subtle part of the character and his face will stand out. If the character has dark skin, often you want to put him in lighter color costumes, unless his environment will be mostly light. I usually try to balance out the black and the white to create a focal points. 4. Once completed, I erase the pencil lines that poke out. 5. The final step is to bring the scan into the computer. Since the original ink is fairly clean there isn’t really any digital treatment of the character itself other than to overlay it on one of my backgrounds and apply some simple shadowing/lighting effects behind him. I hand draw the background designs as well (I may post a tutorial about how to make repeating wallpapers from drawings like this) in line format, then scan them in, convert them to white and overlay them on grey repeatedly. Tommy will be posted on Thursday, so be sure to check out The Daily Mobster and read his story. Who knew I could make it this far with just a silly mobster theme? I have to admit that I worried, I cried, I even confessed to “Mad Ma” Johnson that early on, I would run out of ideas and she might have to break my knuckles. But, I am quickly finding out that just about anything can be turned into a goofy character; I mean, there is a character based entirely off of neckties, and looks like a necktie! The Daily Mobster has just reached 40 mobsters and is quickly nearly the 50 mark! I have a special announcement to make when we reach 50 so make sure to stay tuned, and share with a friend. New readers are always welcome and if you have ideas, thoughts or comments, share them! Thank you all for the following and support. 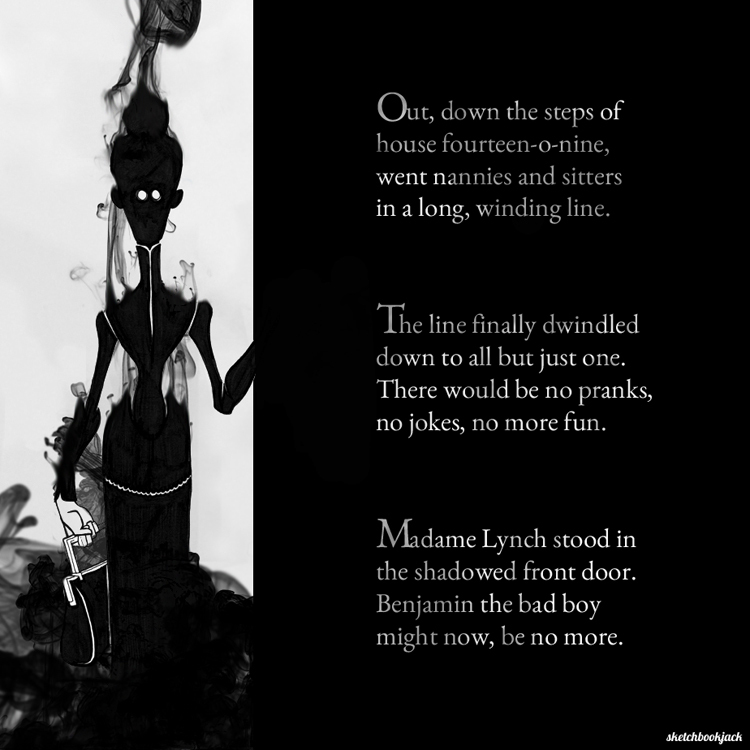 Madame Lynch appears at the Brigham's front door. Illustration Friday’s topic popped up as “Fluid” and I immediately thought of a past project I was working on about three years ago. The villains in the story shed off black, inky, fluid as they moved about. Unfortunately, this was one of those projects I just had to let die as, every time I sat down to work on it I drew a blank and struggled endlessly trying to achieve what I wanted. It definitely taught me how to learn to let something die. I have to admit that I really want to complete this project, but am not regretful that I dropped it. It allowed me to clear my head and start over on several other projects since. I still love the story and the concept, so I am sure I will return to it in the future. The manuscript actually came together quite nicely with the exception of one plot hole, as did some of the initial pencils of each page. But, when I sat down to some of the very important page layouts, to finish the ink for each page, or do the final treatments (and this book had a lot of “effects” involved) it just never looked the way I wanted it to and unfortunately the mood and plot of the story relied very heavily on the visuals. I hope to add it back into my queue of projects sometime. The basic set up for this page is that Benjamin Brigham is a rotter and just a really nasty little child. He plays horribly (really horrible, some times life threatening ;p ) pranks on people, is grouchy and grumpy, and puts up a fight to nearly anything his parents or teachers wish him to do. After being thrown from several schools and scaring away countless nannies and sitters, his parents receive a letter in the mail regarding the most prestigious academy for troubled youth that guarantees perfect results. Madame Lynch, the administrator of the academy has come to collect young Benjamin. 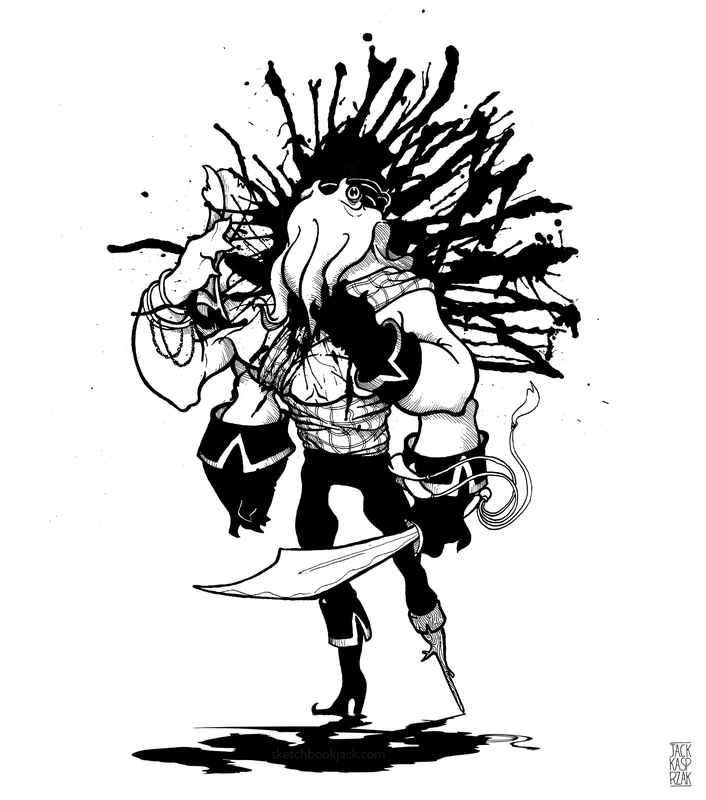 If you like what you see and want to help support SketchbookJack and all his future projects, including printmaking, books, and general illustrations, consider donating.